Last week, the Environmental Protection Agency named the first 10 chemicals it will evaluate under the new Frank R. Lautenberg Chemical Safety for the 21st Century Act, the first update since 1976 of the nation’s primary toxic substances law. The safety reviews could lead to bans or restrictions on a number of hazardous chemicals in consumer products and workplaces, including asbestos, paint strippers, flame retardants and solvents. EWG and other watchdogs will follow this first round closely, because legal interpretations of the new law and aggressive industry pressure could also mean little or no meaningful regulation of these substances at all. The first 10 chemicals were chosen from the EPA’s Work Plan, based on their hazards and the public’s potential exposure, as well as other considerations such as persistence and bioaccumulation. Half of the chemicals contaminate drinking water, and setting health-based standards for them has been on the EPA’s to-do list for years. While selection of the first 10 chemicals is an important milestone, this list contains just the first of 1,000 chemicals in need of urgent EPA review. Under the new law, for each risk evaluation EPA completes, it must start another. By 2020, the EPA must have at least 20 chemical risk evaluations ongoing at any given time. The EPA should be commended for releasing the list ahead of schedule, but completion of the safety reviews and implementation of resulting regulations could take five years or more. Some public health and environmental groups, including EWG, are concerned that the new law will not provide the EPA with the resources it needs to quickly review and, if necessary, ban dangerous chemicals. The law also potentially grants opportunities for industry to drag out the process, and delay or undermine restrictions, as the American Chemistry Council, the industry’s powerful lobbying arm, has noted. Consumers and workers should not have to wait five years or more to be protected from dangerous chemicals. 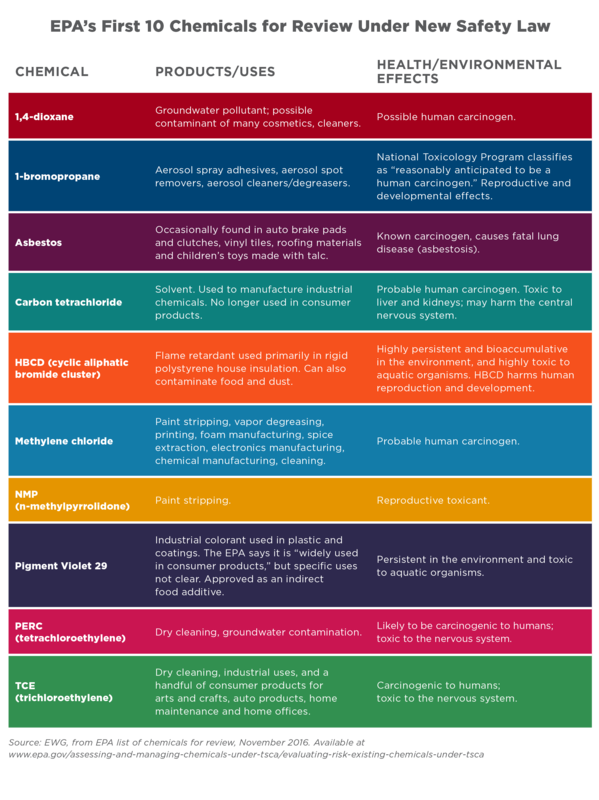 EWG urges manufacturers to act now to replace these chemicals with safer alternatives. Also, many of the hazardous chemicals in consumer products, including cosmetics, are not regulated by the EPA, but instead by the Food and Drug Administration. Congress should act swiftly to update the laws regulating these chemicals to ensure that everyday products are safe. 1,4-dioxane is a industrial solvent, but also a byproduct of making compounds known as ethoxylated surfactants and emulsifiers, commonly used in cosmetics and detergents. In 2008, it was found to contaminate almost half of personal care products tested. In 2009, an EWG investigation found that drinking water providers had detected 1,4-dioxane in the drinking water served to more than 1 million Americans. As a byproduct, 1,4-dioxane can be stripped from products and some manufacturers report doing so before these products are offered for sale. But companies don’t have to report its use or presence in consumer products, so it’s hard to know whether a given product with ethoxlyated ingredients contains 1,4-dioxane. To avoid purchasing personal care products and cleaners with 1,4-dioxane, consumers must read labels and avoid a long list of potentially contaminated ingredients. In 2013, the EPA classified 1,4-dioxane as likely to be carcinogenic to humans. The EPA’s Integrated Risk Information System says water contaminated with less than one-third of a part per billion could cause one additional case of cancer in every million people who drank it for a lifetime. Exposure can also damage the kidneys, liver and brain, and irritate the respiratory tract. 1-bromopropane is a solvent used in dry cleaning, spray adhesives, spot removers, coin cleaners, lubricants and degreasers. The National Toxicology Program classifies it as reasonably anticipated to be a human carcinogen. California lists it as a chemical known to cause reproductive harm and cancer. The EPA says it's particularly risky for women who are pregnant or of childbearing age, on the grounds that even short-term exposure could harm a developing fetus. A metabolite, or a compound produced by the breakdown of a chemical in the body, of 1-bromopropane was found in more than three-fourths of Americans’ blood in a 2011 to 2012 sampling by the U.S. Centers for Disease Control and Prevention. Many Americans mistakenly think asbestos was banned decades ago. Though now uncommon, U.S. industry still imports, uses and sells asbestos and asbestos products, including automobile brake pads and clutches, vinyl tile and roofing materials. In 2015, EWG tests found asbestos fibers in imported children’s toys, including crayons and crime scene fingerprint kits. The Occupational Safety and Health Administration says there is no safe level of exposure to any kind of asbestos. Inhalation or ingestion of asbestos fibers can cause lung cancer, a rare and incurable cancer called mesothelioma, and asbestosis, a scarring of the lungs that often leads to heart failure. EWG Action Fund estimates that asbestos-related diseases kill 12,000 to 15,000 Americans per year. In 1989, the EPA ordered a phase out and ban of most products containing asbestos. But the asbestos industry sued, and in 1991 a federal appeals court ruled the EPA had not proven a ban was the "least burdensome alternative" for protecting public health. This not only overturned most of the ban, but set a precedent that made it almost impossible to ban any other dangerous chemical. Under the new chemicals law, the EPA must still consider costs, but no longer must prove a regulation to be the least burdensome method. Carbon tetrachloride is a solvent that was widely used in home and industrial cleaning applications, fire extinguishers and as a grain fumigant. Since the 1970s, uses in consumer products have been banned because it is highly toxic. But it is still used to manufacture industrial chemicals, and exposure may occur through air or contaminated drinking water. In 2009, EWG reported that carbon tetrachloride was detected in the drinking water served to more than 9 million Americans, at concentrations that exceeded health guidelines. The National Toxicology Program categorizes carbon tetrachloride as reasonably anticipated to be a carcinogen, and the EPA says it is likely to be a human carcinogen. It can also damage the kidneys and liver, and in fact is regularly used in lab experiments to induce liver damage. HBCD is a flame retardant used primarily in rigid polystyrene house insulation. People are exposed to HBCD from contaminated food and dust: One study found HBCD in seafood, meat and peanut butter purchased from a grocery store in Texas and in 2004, EWG detected HBCD and other brominated flame retardants in dust samples from 10 American homes. The EPA says HBCD is a potential health hazard to humans based on "animal test results indicating potential reproductive, developmental and neurological effects." It is highly persistent and bioaccumulative in the environment, and is listed under the Stockholm Convention, an international agreement to ban Persistent Organic Pollutants, or POPS. The European Union and China have committed to phase out HBCD by 2021, and major manufacturers such as Dow and BASF have initiated a phaseout of production. The U.S. is the only major nation that hasn’t signed the POPs treaty. Methylene chloride is primarily used as a paint stripper, especially for refinishing bathtubs. According to the CDC, from 2000 to 2013, at least 14 workers died while using methylene chloride during bathtub refinishing. People are most likely to be exposed through its use as the primary ingredient in many paint strippers, as well as use in adhesives, aerosols, metal cleaners and pharmaceuticals. EWG reported in 2009 that methylene chloride was detected in the drinking water of more than 20 million Americans, at concentrations that could pose a risk to human health. In 2011, the EPA classified methylene chloride as “likely to be carcinogenic to humans” and inhalation of this highly volatile chemical can harm central nervous system, causing headaches, dizziness, nausea, memory loss and eventual death. The EPA completed a partial risk assessment of methylene chloride in 2014 and indicated in 2016 that it was in the process of developing regulations. NMP is a solvent used as a paint stripper, and in petrochemical processing, engineering plastics, agricultural chemicals and other applications. The EPA's 2015 risk assessment said it can cause reproductive and developmental harm, particularly during critical windows of development, from both short- and long-term exposures. The primary routes of exposure are through inhalation and absorption of the vapor through the skin. The EPA has completed a partial risk assessment of NMP and indicated in 2016 that it was in the process of developing regulations. Pigment Violet 29 is an industrial colorant used in plastic and coatings. It is approved by the FDA as an indirect food additive, a classification for chemicals used in food packaging (i.e., inks and glues) which might leach into food. Although the EPA categorizes it as “widely used in consumer products,” there is virtually no information available to the public about products that might contain this chemical. Data on human health hazards are also sparse, but Pigment Violet 29 is categorized by the EPA as persistent in the environment and toxic to aquatic organisms. PERC, also known as perchloroethylene and tetrachlorethylene, is a solvent used as a dry cleaning fluid by approximately 28,000 U.S. dry cleaners, according to the EPA. It is also used in household products such as water repellents, spot removers, wood cleaners, adhesives and silicone lubricants. Every year, U.S. industrial facilities release more than a million pounds of tetrachloroethylene into the environment, including soil, air and drinking water. The National Toxicology Program says PERC is "reasonably anticipated" to cause cancer, and it's on California's official list of known carcinogens. Human studies and animal experiments indicate that exposure might lead to a higher risk of bladder cancer, multiple myeloma or non-Hodgkin’s lymphoma. The chemical has also been linked to harmful effects on the nervous and reproductive systems, and may adversely affect fetal development during pregnancy. TCE, or trichloroethylene, is a solvent used as an industrial and a general household degreaser, as well as an ingredient in products such as paint thinners and removers, adhesives, dry cleaning agents, stain removers and carpet cleaners. Health risks from TCE exposures are highest when using airborne products such as aerosol degreasers, spray fixatives or spray cleaners. EWG estimates that nearly 23 million Americans had TCE in their drinking water in 2009. The EPA classifies TCE as "carcinogenic to humans" by all routes of exposure. It is a developmental toxin, especially dangerous during pregnancy, and adult exposure has been linked to development of Parkinson’s disease. Workers exposed to TCE have a higher risk of lymphatic and haematopoietic cancers, such as non-Hodgkin's lymphoma. The EPA has completed a partial risk assessment of TCE and regulations on two uses of TCE are in progress. 16 EPA, TSCA Work Plan for Chemical Assessments; 2014 Update. 2014. 24 EPA, TSCA Work Plan for Chemical Assessments; 2014 Update. 2014. 34 E.A. Lock et al., Solvents and Parkinson Disease: A Systematic Review of Toxicological and Epidemiological Evidence. Toxicology and Applied Pharmacology, 2013, 266(3): 345-355. 35 S. Karami et al., Occupational Trichloroethylene Exposure and Risk of Lymphatic and Haematopoietic Cancers: A Meta-Analysis. Occupational Environmental Medicine, 2013, 70(8): 591-599.